The handsets that fall in the business category seem to be flourishing. This is once again proved by the Gigabyte M1220, which looks as good as the Treo Pro/Bold, utilizing the same form-factor . Because of this, it features a landscape-oriented touch-sensitive screen in QVGA resolution, measuring at 2.4 inches. The other distinct feature is the QWERTY keyboard, which seems to have some well-sized keys . Still, the M1220 will not be a regular smartphone, for it will run Windows Mobile 6.5 Professional, delivering the latest in business functionality. 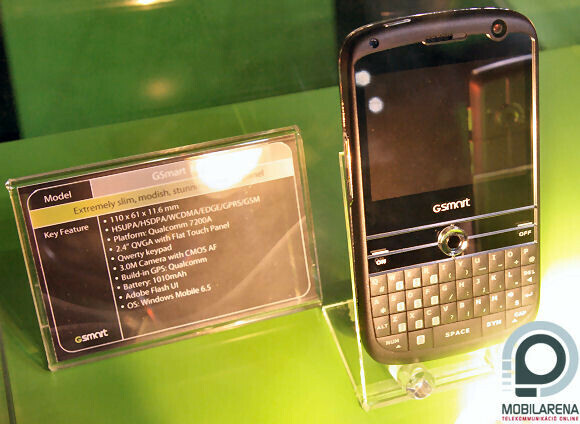 Not only this, but it will also take advantage of Gigabyte’s own flash-based Smart Zone User Interface. Of course, a device of this class will not show up without the proper equipment, which includes a 3.1MP camera, additional 0.3MP camera for video conversations (the M1220 supports HSDPA/HSUPA), Wi-Fi, GPS and accelerometer. In contrast to what you may have thought, the device will actually use a completely standard Qualcomm 528MHz processor and the modest 128 MB of RAM. All this sounds great, but you know the rules – no WM6.5 devices before the second half of this year at the earliest, and yes, not a single word on pricing so far.